Dive down below the depths to a place that was thought lost to time - Atlantis! Click here to play! An advanced civilization lost to the sea, Atlantis has been sought after for millennia. Who knows what riches it could yield to brave explorers who find the lost city and claim its ancient spoils? 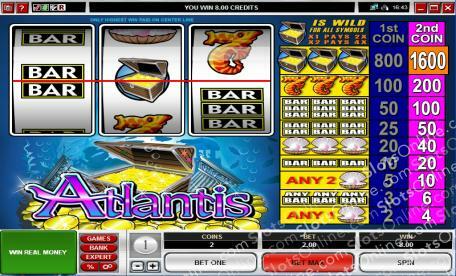 The Atlantis slots are a simple 3-reel classic slots games that features chests filled with gold. Lucky 7 shaped seahorses, BAR symbols, and precious pearls from giant clams. A single payline means you'll never be confused by how you've won on the Atlantis slots. If you think you have the courage and luck to escape from Atlantis with a fortune in pearls and gold coins, then be sure to dive right in to the Microgaming Atlantis slots. The Golden Chest symbol is wild and substitutes for all other symbols. When 1 Golden Chest symbol substitutes, the win is doubled. When 2 Golden Chest symbols substitute, then the win is quadrupled. 3 Golden Chests payout the jackpot.